It was a highly thrilling moment at the FIBO 2013 in Cologne. In an aisle of the bodybuilding section an 18-year-old well-toned guy took off his black tank top, and began to flex and pose for a photographer from Athletic-Star.com. Soon more and more people gathered to watch the guy as they were amazed at his ripped physique and lean size. He seemed reserved but cool, and evidently enjoyed showing off his imposing body for the camera and the enthusiastic crowd. This young fitness man is Nick Gomez from Valenciennes in France. He stands 5' 9 at 185 lbs. Nick loves fitness. He started working out at 16 doing push-ups and sit-ups. Now he studies sport, and aspires to a career in fitness modeling. This seems very promising in view of his sculpted physique, his handsome, expressive face, and his winning charisma. Nick remembers: "My first meeting with Athletic-Star at the FIBO was rewarding, because I was a novice in the field of fitness modeling." Now he is totally determined. Nick: "I try to work each muscle twice a week. My favorite muscles are biceps and shoulders." He has a balanced and healthy diet, apart from some exceptions on the weekend. "I eat meals with many carbs like pasta and a lot of meat like steaks. In the evening I eat vegetables with turkey or tuna, and between the meals cheese, fruits, and rice cake." Sometimes he drinks a protein shake, but he is not one for supplements. Nick is convinced: "Being natural is a mental strength for me." At the moment he does not much cardio training, because he intends to gain muscle mass and to get at 200 lbs. He wants to develop an aesthetic, well-proportioned physique, improve in every respect as he strives for perfection, and is inspired most by the popular fitness models Jeff Seid and Lazar Angelov. Nick: "I would like to go to America and be a role model for all young people who want to change their shape. And I want to enter contests, because I love competition." In the fitness modeling contest Mister Athletic 2013 Nick has made it to the finals (October 21-31). People can vote for him on http://www.arnold24.com/misterathletic2013. What is heavier: the weights he has been lifting, or the muscle mass and the physique he has built with them? Cody Redmond comes to AllAmericanGuys from the east coast of Florida, where he was raised. Interestingly enough, Cody was born in Queens-- in the heart of New York city. Since very little Cody has always been an active guy. He enjoys all sports but especially loves bodybuilding. The beefy hunk was discovered by AAG's contributing photographer Luis Rafael, and since his first shoot with Luis in Miami he's been in high demand ever since. Watch for more of this promising young man. You find many high quality photos and videos of Cody Redmond here on AllAmericanGuys. Nick G. - Sebastian M. - Joe L.
Rico L. - Ben S. - Lukas E.
Danny R. - Eike W. - Ekin A.
Tim S. - Phillip Z. - Nino R.
Bakdasch I. - David N. - Maurice L.
You can decide who will win. On http://www.arnold24.com/misterathletic2013 all 15 competitors are featured with photos and videos, and show off their imposingly ripped physiques. Choose your favorite athletes, and click on the Facebook button "Gefällt mir" (Like). This t-shirt covers far more than stunning washboard abs. 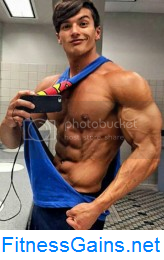 Zack Dudley is a fitness model who has built a heavily muscled, well-defined upper body. And his strong and well proportioned legs show that he does not skip leg day in his workout routine. You find many high quality photos and videos of Zack Dudley here on AllAmericanGuys. They have lifted weights intensely, have eaten properly, and have led a very disciplined lifestyle to build a maximally sculpted physique. 80 young fitness enthusiasts and aspiring models are competing for becoming Mister Athletic 2013, a spectacular vote presented by the new fitness shop Arnold24.com. The voting consists of a preselection (80 competitors, October 9-19) and a final (15 competitors, October 21-31), and is taken by the visitors of Arnold24.com and an expert panel (fifty-fifty). The winner of the first prize will be proclaimed on November 2, and will get a one-year sponsoring of Big Zone worth 1,000 Euro. Other winners can look forward to outfit and equipment of Gym Aesthetics and to a big photo shooting in Berlin. You can decide who will make it to the finals. On http://www.arnold24.com/misterathletic2013 all 80 competitors are featured with photos and videos, and show off their imposingly ripped physiques. Choose your favorite athletes, and click on the Facebook button "Gefällt mir" (Like). When he takes off his t-shirt, an admirably ripped upper body comes to light. Jakob A. is originally from the Chicago area but now resides in Florida. He's a personal trainer and also models part time. Jakob enjoys fishing, spending time outdoors and traveling. Modeling is somewhat new to Jakob but he is looking to expand his horizons and see where it takes him. You find many high quality photos and videos of Jakob A. here on AllAmericanGuys.